Either way, no right-hand Wookie of Han Solo is going to do well showing up to the desperate fight (or flight) with your fur half burned away by an awry laser blast. What is a Wookie to do? Your alliance and warriors’ honor keeps you in the fight long after everyone else would have ran off, screaming into the darkness like a sad Emo child… but not you! 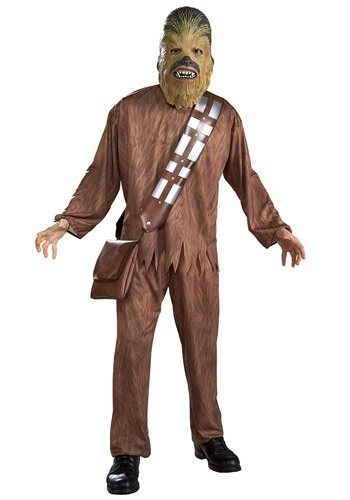 Well, we have a solution in the Chewbacca Adult costume. Don these comfortable brown shirt and pants with safe and far-less-flammable fur print. Strap your polyfoam bandolier across your chest (and even secure any additional weapons or accessories in the large pouch at your hip) and then offer your enemies a terrifying Wookie wail from behind your ferocious mask. The Stormtroopers won’t know what is coming as you come to seek vengeance and freedom from the Empire.